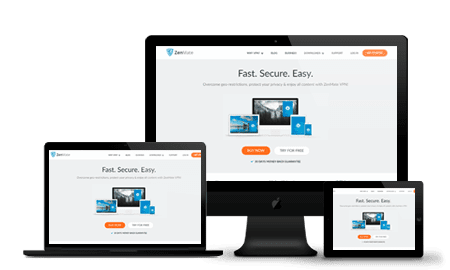 ZenMate is a Germany-based VPN service that provides secure tunneling and safe browsing across all devices. The company has only been around since 2014 but has gone grown quickly in order to deliver a VPN service that can compete with the big guns. It offers a pretty impressive service with advanced security features. ZenMate offers a free service as well as a premium service package. You can enjoy ZenMate through the browser add-on VPN, a bare-bones version in comparison to other VPN packages on offer. A one-off month ZenMate will cost you $8.99 but a six-month commitment will drop it down to $7.49 per month, and a year commitment is only $3.99 and gets you 3 additional months for free. ZenMate accepts all major credit cards, as well as UnionPay, PayPal, and Bitcoin. If you’re looking to stay completely anonymous, then the Bitcoin payment option is ideal. ZenMate also offers a seven-day free premium trial that gives full access to all premium features for one week. This zero-logs, privacy-oriented VPN provider has all the basic features you’ll need to enjoy a secure connection and protect your online activities against threats. ZenMate offers a free, limited version of their software as a Chrome extension for desktop and mobile. There’s no need to create a password to use this version. However, the premium plans offer faster speeds and more flexibility when it comes to usability and accessing server locations. Another bonus is that the app can accommodate a variety of language, and the website is available in 9 languages. ZenMate has at least 24 different servers in 30+ countries around the world. They may not be able to compete with the server count of some other popular VPN providers, but they do have their servers located in key locations around the globe, and their server count is expected to continue to grow. The high-speed servers provide enough internet juice to enjoy a speedy service, allowing users to partake in streaming HD video and music from services like Netflix, HBO Go and Spotify. ZenMate is currently available for three different internet browsers including Google Chrome, Mozilla Firefox and Opera as well as other desktop browsers on the Chromium Open Source Browser Project, such as SRWare Iron, Chromium and Comodo Dragon. ZenMate has iOS and Android apps available, and this one provides a classic VPN connection using IPsec. ZenMate is very reliable when it comes to security. Its secure service is achieved through using a TLS 1.2 (RFC 5245) protocol with 128-bit AES-GCM encryption, RSA handshaking, and robust SHA 256 used for authentication with PFS. This VPN encrypts all data between your devices and their secure servers. ZenMate promises that it keeps no data logs or personal information. Since P2P isn’t noted as secure or recommended, if you’re a avid torrent downloader, then it might be best to contact the support team about the privacy limitations here. Furthermore, because ZenMate is based in Germany, they are subject to the strict cyber laws in that country. What’s more, since ZenMate’s parent company is based in Germany, it must comply with some privacy-limiting cyber laws that are currently under review in connection with the Data Retention Directive (DRD). This is why many other VPN providers don’t set up shop in Germany, as these unfavorable security issues can leave people on edge about their VPN activity. ZenMate’s customer support service is somewhat limited compared to other VPN providers. ZenMate only offers help through email, although users can expect a quick turnaround time and a helpful response. What’s more, the set up guides and knowledge base provide tons of clear-cut information and help answer any questions you may have. The information is easy to follow and doesn’t overwhelm with detail. ZenMate likes to keep active on its social media platforms, so users can stay up to date with the latest offers and information on Twitter or Facebook. ZenMate delivers stable speeds without drag or buffering. Users can enjoy uninterrupted streaming and fast loading times on speed-hungry video and music platforms. When we tested it, the speed was consistent, with speeds usually hitting between 20 Mbps and 70 Mbps. The speeds run smoothly with multiple tabs open including YouTube, music streaming and file download all at the same time. ZenMate is easy to use right from the get-go. The sign-up process is super quick, and if users want the free version, they only need to download the extension relevant for their browser. The browser is always encrypted when the plugin is turned on, and the location is selected automatically based on the user’s location. However, this can be changed pretty easily. If you’re ready to commit to a paid package, then all you need to provide is your email, password, and billing information. Everything is displayed clearly and streamlined to get the user to the right place. The website is very clear about what you get with the service, and the breakdown of information is easy to digest. ZenMate does everything you’d expect from a simple VPN while offering a high level of online security. It’s one of the most efficient VPN providers on the market with reliable, lightweight software and brilliant online protection from any pesky threats such as snoops and hackers. Our senior reviewer, Maria, has been tinkering with computers since a childhood spent in her father’s workshop. Her passion for technology – and her ability to explain complex concepts in an approachable way – is unequaled. She is a regular contributor to the Top 5 VPN blog.